Powdersville Elementary School in Anderson School District One received wonderful news this week when a representative from Michelin North America visited the school and informed them that their environmental stewardship grant had been fully funded to the tune of almost $17,000. 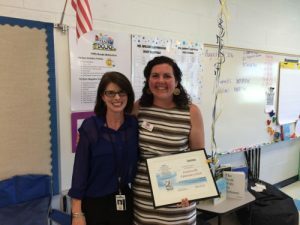 Ms. Melissa Wilcox, a fifth grade teacher at Powdersville Elementary, wrote the grant with hope of furthering the problem-based learning unit on healthy honey bee hives that third graders had completed the year before. The vision for this project is to expand the bee project with education on sustainability and nutrition in the classroom and into the community. By taking advantage of research and gardening ideas at Clemson University, part of the project will install for each classroom (3rd-5th grade) a raised bed garden (used for pollinator friendly flowers and vegetables) that not only supports the bee project but provides an opportunity for hands-on learning that has real-life implications in the community. “As a South Carolina public school, we are committed to developing young people prepared to be employed in the workplace as productive, team-oriented employees, as well as being community-minded citizens,” Ms. Wilcox emphasized. The project will foster school and community partnerships and provide increased student opportunities for real world problem solving and hands-on learning, aligned with South Carolina College and Career Readiness Standards and the Profile of a South Carolina Graduate.